It's been a few years since I sat down and watched shows on Disney Juniors since my kiddos are a bit older, so I'm pretty excited to start watching the shows again with the newest little one. One of the shows that caught my attention when my son was younger was the, Imagination Movers. They not only had catchy songs that I still remember til this day, if there was a problem, they were determined to solve it without giving up, which is something I loved most about my kids watching the show. The live concert features the Movers’ trademark catchy, pop rock and iconic blue jumpsuits performing songs from the hit Disney Junior series and their chart-topping album “Back In Blue,” which debuted as the No. 1 Children’s Album on iTunes in Canada. The show includes lots of audience participation, tons of high fives and even a healthy dose of flying toilet paper. There will be guitar solos, drum solos, corny jokes and even an appearance by the Movers’ little buddy, Warehouse Mouse. 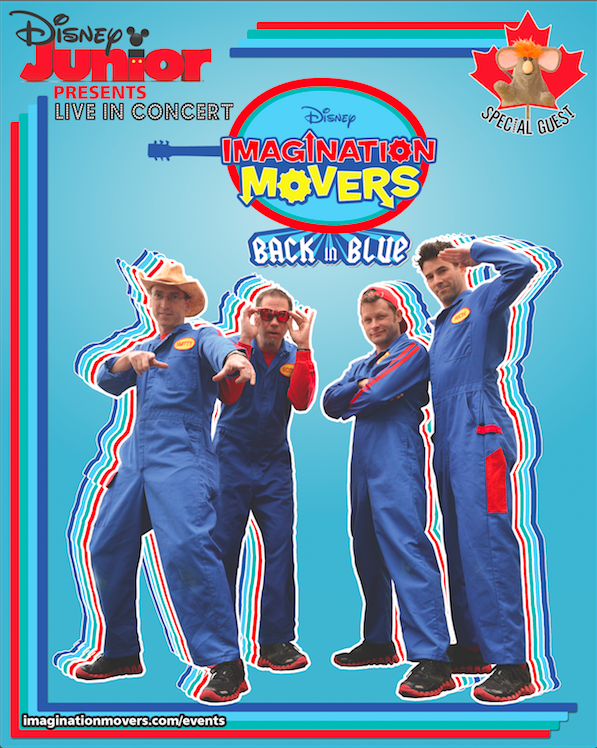 For complete details on the, "Back In Blue," concert and for ticket purchase, be sure to head to Imagination Movers or DisneyJunior.ca. Just Us Girls is teaming up with the Imagination Movers to provide our readers not one, but two fun filled prizes! This giveaway is only for our Canadian readers. MOVERS BUNDLE PACK - Digital download of the Movers’ latest album: Back in Blue, a Movers t-shirt, and an autographed postcard.